Part 1 offered an abstract and introduction to the blog series, as well as an overview of Wet Bond Lamination. Part 2 will go through Dry Bond Lamination and Thermal Lamination. 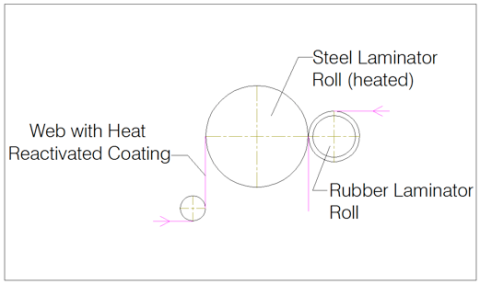 Part 3 will discuss a few design considerations, including Roll Design, Nip Pressure Control, and Gap Control. Part 4 will wrap the series up, finishing with design considerations including the Roll Drive, Alignment, Web Handling, and Guarding and then offer a brief Conclusion. In Dry Bond lamination, an adhesive coating is applied to the web and dried (solidified) prior to lamination. As with wet bond lamination, this system can take one of several forms. Another form of dry bond lamination which is very similar to that described above, is one in which a curable adhesive is applied to one of the webs. In this case, the web then passes through a curing assembly such as an electron beam or ultra violet unit to cure (solidify) the adhesive. As before, once the adhesive is cured, the coated side of the web is combined with a second web at the laminating nip with the adhesive bonding the two webs together. A third form of dry bond lamination is one in which one or more of the webs to be combined are pre-coated with adhesive. This is often referred to as off-line laminating since the coating and drying/curing processes occur in a different process prior to the web(s) being introduced to the laminator. This type of lamination can take one of several forms depending on the adhesive being used. In the simplest form, the adhesive can be a typical pressure sensitive type which has the ability to stick to surfaces it contacts at room temperature. The equipment required for combining these webs is typically a relatively simple machine including the unwinds, a lamination nip, and a winder. Often the coated side of the web is protected with a cover ply, which needs to be peeled prior to lamination and wound on a separate winder. Another form of dry bond lamination using pre-coated webs is one in which a heat activated adhesive is used, requiring that heat be applied to the web(s) prior to combining. This heating can occur either prior to the web(s) being introduced to the lamination nip by passing the web(s) about heated rolls or in front of a heater (such as an I.R. assembly), at the laminating nip with the coated web wrapping the heated steel laminating prior to the lamination point, or both (See Figure 4). Since the adhesive is already solidified prior to lamination, the lamination nip on a dry bond laminator is typically run at moderate to high pressures, and depending on the application, is often heated. In a system where the adhesive is applied to the web in line with the laminator, it is desirable to have the lamination point as near to the exit of the dryer as possible to minimize exposure of the coated web as well as maintain the heat in the web/coating for those processes that require heat at lamination. For off line systems that require pre-heating of the web, this should occur as close to the lamination point as possible so that the heat that is put into the web(s)/adhesive(s) is not lost prior to lamination. For those applications where heat is required for lamination, it is important to cool the web after lamination as quickly as possible. In Thermal Bond lamination, which is often referred to as fusion lamination, two or more webs are combined using heat and pressure without any adhesives. Since the webs are being combined using just heat and pressure, without the use of any adhesive, it is important that the webs being combined have similar thermal properties. In this form of lamination heat is applied to one or more of the webs prior to lamination. It is typical that the lamination nip features a large diameter main heat roll, about which the primary web travels, being heated prior to reaching the nip point. The secondary web, which may also be preheated prior to lamination typically by passing about preheat rolls, is introduced to the primary web at the nip point. Depending on the nature of the webs being combined, the two webs may exit the lamination point and continue on to cooling rolls, or they may continue to travel around the main heat roll where additional heating occurs. In some cases, the laminate will pass through additional nip points as it travels about the heat roll (See Figure 5). 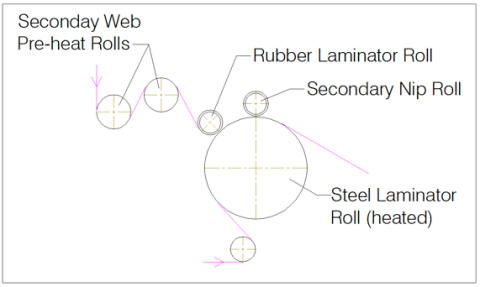 This same configuration can be used to introduce additional webs to the laminate as the primary and secondary web continue to travel around the main heat roll. Another lamination method which can be classified under thermal bond lamination is one where an adhesive in web form is used between two other webs. In this case the primary web is typically still preheated about the main heat roll, with the web adhesive and secondary web introduced at one or two nip points about it, much the same as a three ply lamination would be produced. In a thermal bond laminator, the lamination nips typically run at moderate to high pressures to assist in the bonding of the webs. The control of the heating of the webs is critical since not enough heat will result in poor bonding, while too much heat will distort or melt the web. The amount of heating and temperatures that are required is typically determined by factors such as the type of material, thickness, and operating speed. It is important that the preheating of any web is performed as close to the lamination point as possible. It is also critical that the product be cooled as soon after lamination/exiting of the main heat roll as possible.